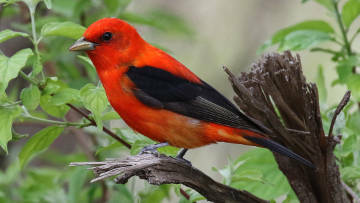 A male scarlet tanager in spring breeding plumage with red body and black wings and tail. Is there anything better than seeing a bright red northern cardinal? If you happen to spot a scarlet tanager in the spring, you just might say yes. Here in Massachusetts, we’re so used to seeing our resident male cardinals (Cardinalis cardinalis) year-round with their bright red plumage that you’d think nobody would get excited when a different red bird shows up. But every spring, as many birds migrate to and through our area, people get excited about spotting a scarlet tanager. In spite of their color, scarlet tanagers (Piranga olivacea) are not exactly easy to see. A male might catch your eye with its red body that rivals a cardinal’s, and black wings and tail – as long as the season is spring or summer. In fall, when these birds fly south to winter in far-away places from Panama to Bolivia, the males will have lost their famous scarlet feathers. They’ll be green then, much like the females of their species, but will still have their black wings and tail. Not surprisingly, the green females blend in so well with the foliage that they’re an unlikely sight for us at any time of year. You might expect such a lovely bird to have a lovely song (to our ears, at least). But no, scarlet tanagers sing a hoarse, raspy song with a rhythm similar to a robin’s. They’re often described as sounding “like a robin with a sore throat.” (But songs can be confusing. If you listen to the robins in your yard, you may find that some seem musical and others actually sound rather hoarse.) Both male and female scarlet tanagers sing, but the female’s song is softer. Male and female sometimes sing back and forth. Both also make a fairly distinctive, harsh “chick-burr” call. It can be helpful to you in identifying a raspy song as belonging to a scarlet tanager. Where are you most likely to see a scarlet tanager? Look in the treetops, where these birds search the leaves and bark for insects. That’s also where they prefer to nest (30 feet up or more). In summer they also feast on fruit and berries, which grow on lower vegetation. Scarlet tanagers are birds of forest interiors. In this way they are unlike our familiar northern cardinals, which often live in suburbs and forest edges. You’re most likely to see a scarlet tanager if you’re in woods where trees are tall and mature, including some with wide trunks that you can’t get your arms all the way around. It also helps to be far from the forest edges. Large, unbroken tracts of forest are best for scarlet tanagers, especially when it comes to nesting – and that, after all, is what they come north to do. In Westborough, keep your eye out for scarlet tanagers in the Headwaters Conservation Area (around Mill Pond), the wooded sections of the Mass Fish & Wildlife management area and around Lake Chauncy, and Charm Bracelet trails through the woods to Cedar Hill. In nearby towns, likely areas include Upton State Forest and Mass Audubon’s Broad Meadow Brook wildlife sanctuary (off Rt. 20 in Worcester). Why do scarlet tanagers need forest interiors and large unbroken tracts of forest? One reason is food. The big trees are large, reliable sources of insects. Large native maples, beeches, and oaks host lots of different insects. Another reason is safety. Many animals that thrive at forest edges – such as raccoons, crows, blue jays, pet cats, and cowbirds (which lay their eggs in other birds’ nests) – pose a danger to scarlet tanager nests and young. These animals are much less common in deep forest. The good news for scarlet tanagers – and people who enjoy seeing them – is that forests have been re-growing in the eastern U.S., including Massachusetts, for a century or more as agriculture has become less common. The bad news is that ongoing development – housing, industry, shopping centers, roads – tends not only to reduce the size of forests, but also to break them up into fragments. That means more edges and less forest interior. Studies have shown that scarlet tanagers are moderately sensitive to forest fragmentation. These birds do better in the eastern U.S., which has more connected forests, than in the midwest, where forest fragments are more isolated and cowbirds are especially common. In our area, scarlet tanagers are more likely to frequent small wooded areas if these patches are near or connected to much larger forests. Populations of scarlet tanagers in Massachusetts are considered relatively stable, but Mass Audubon’s breeding bird surveys still show a declining trend since 1980. This information brings up the question of what the future holds for these birds (and others with similar needs), as development continues in our state. On a different note, recent genetic studies – of the sort that are leading scientists to revise the family trees of many different kinds of animals and plants – suggest that scarlet tanagers may actually be more closely related to northern cardinals than previously thought. Both of these red birds may belong in the same family, the cardinal family (Cardinalidae). If you’re lucky enough to spot a scarlet tanager this year, or if you enjoy the possibility of finding one when you’re out looking and listening for birds, remember their need for large, unbroken and undisturbed forests. And think about what we can do in Westborough to protect and preserve mature forests.